I really think they are alive! I think my Agave perryi 'Super Hardy' have lived up to their name! The small one (a pup from the big one) isn't quite as happy, with a few mushy leaves, but the damage seems to be just on the outer portions of a couple leaves -- no signs that the center of the plant is rotting out. I'm so thrilled! I didn't even give a special spot -- I put them in a relatively well-drained part of the garden, but no special rock garden treatment or anything. Who knows it they will prove to be reliably hardy over the long run here in zone 5 (unlike the rest of the country, we had a slightly milder than usual winter) but I think I could recommend them with confidence in zone 6. The sad news is that I no longer know of a source for it. I got mine from the always amazing Arrowhead Alpines but they don't list it in their catalog for this year. Luckily it seems to make pups pretty freely, so hopefully I'll be able to have lots of them soon. 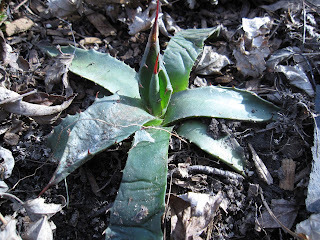 And you never know -- we you visit Arrowhead in person, they often have plants that didn't make it to the main catalog. If I can, I'm getting more. The snow is finally melting, and all of us Northern gardeners are giddy with joy, and we're all posting about the very same set of plants: Snowdrops, crocuses, witch hazel and helleborus. This post is about an entirely different set of plants. 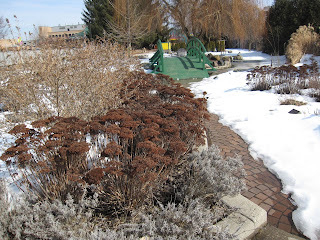 Back in December I took a stroll through the gardens at Michigan State, and wrote about plants for winter color -- so I thought I would revisit those plants now, and see what I'm thinking. And smells like rotten cabbage. Yuck. Yuck. Ugh. 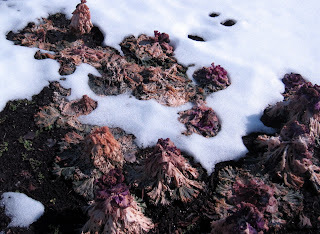 These might be good plants for a milder climate, but this is NOT what I want to see when the snow first melts. Another looser are the deciduous hollies -- they looked stunning in December, but every berry is now long gone. They are nice for fall/early winter, but don't go the distance to early spring -- and the same is true of every other berry in the gardens. They simply don't last long enough to qualify for real winter interest. This is amazing color anytime -- but for March in Michigan, it is unbelievable. Looks just as bright as it did in the fall. 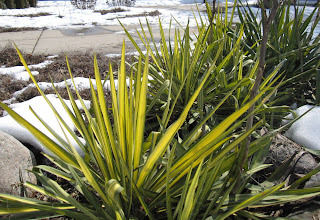 The it a LOT of color for something that was under 6 inches of snow just a couple days ago! And wouldn't it be stunning with deep purple crocuses coming up through it? 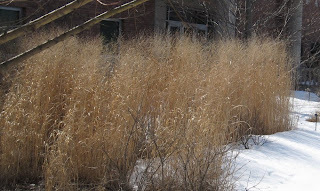 So I'm starting to put together a winter/early spring garden in my head: A backdrop of evergreen conifers, a swath of ornamental grass, and red-twig dogwood, lots of Yucca 'Color Guard' fronted with 'Autumn Joy' and 'Angelina' peppered with splashes of purple crocus and dwarf iris. Wouldn't that be marvelous? What would you add? This is just weird, but: This product monitors soil moisture, light, and temperature in your garden and relays the information to your iphone. Really? To an iphone? So you can garden without living the comfort of your house, or what? Highly recommended: An AP piece on gardens made by soldiers at war -- from WWI, Vietnam, to Iraq and Afghanistan. A fascinating read. Mat Kinase reviews Stewart Brand's new book -- which I am itching to read. I should buy a copy already. This is something like the third time I've linked to things related to it. Ben's Garden blog posts about the power of plants to prevent crime -- he cites really cool research, and the goes on to muse how Dicken's novels might be different if the characters had more plants in their lives! Terrific stuff. Bad science reporting over at the LA Times: The headline and first paragraph imply spinach from the supermarket may be more nutritious than spinach from your garden or a farmers market. The actual study, however, simply shows that spinach stored for 9 days in light is more nutritious than spinach stored in the dark. The actual take home: Eat stuff when it is fresh and minimize the time it is sitting in your fridge. Best way I know to do that: Grow your own, and harvest right before you eat. From the NYTimes, a biodegradable bag called the "PeePoo" which you put... well, feces in. The bag breaksdown, AND kills disease causing organisms in the poop. It is designed for toilet less third world slums, and is a fantastic idea -- reduce disease, and create fertilizer. Am I weird for wishing they sold them here? To greenhouse or not to greenhouse? 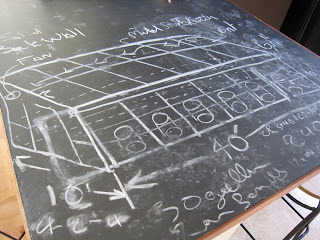 So, my partner (who is able to build anything) drew a design on our chalkboard counter top for a 400 square foot greenhouse for the back yard that he thinks we could build for about $1000. How amazingly tempting... I want one. But it really doesn't make sense: we'll be moving in a year and a half when I graduate, so if we built the greenhouse, I'd only have one winter to use it. Much more logical to wait until the next house (After which I SWEAR I shall never move again -- I'm staying put and planting TREES!) and build an even bigger, more marvelous greenhouse there. Do you see the little topiary bear, his arms raised as if he's jumping for joy, tucked back in the middle of all the other shrubs? This is a picture of the growing field of a nursery in Japan that sells shrubs, most of which have been sculpted into some shape or the other. I love this particular image because it reminds me to be a little fun and silly in the garden. Too often I get so obsessed with creating the "perfect" design I forget to be a little goofy. I need to tuck more joyous bears in my garden this year. 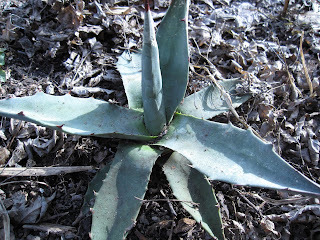 Loree, of Danger Garden, is growing an agave. In her car. Yes, as in INSIDE her car. Proof, finally, that I am NOT the biggest plant nerd in the world. The always excellent Jeff Gillman muses about the relative toxicity of caffeine and 2,4-D herbicide. Seeds in the City bids goodbye to their dead bee hive... They've had a sad series of posts about the death of the hive, and it is keeping me on the fence about getting a hive for myself. But if clearly, they have no regrets... should I? Shouldn't I? Bees? No bees? Maybe next year? I can't decide. Biofortified shares a terrific comic about the dreadful inaccuracy with which the term "organic" is used. For science nerds only. 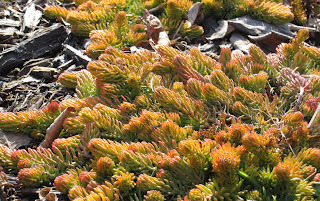 Gardening Asylum posts about the excellent and very under-appreciated Corydalis lutea.